We theorized on Monday that Canada’s cannabis “supply shortage” is actually just a shortage of consumer-grade flower and oil, and we aren’t the only ones who think so. 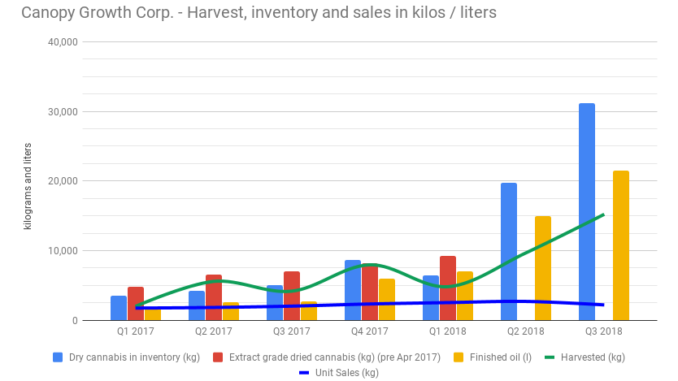 If we’re right, and the gap between Health Canada’s inventory total and the total cannabis available for sale has to do with some of these mega-facilities failing to scale, then investors can stand to look for cultivation assets that have been mispriced by the market; including some high-efficiency operators with an opportunity to pick up the slack. But we don’t expect you to take our word for it. Fundamental Hype‘s research staff has spent a few maddening days gathering and wrangling various data points to try and get a look at who’s growing the dope that sells. A fond shout-out to the good people over at The Deep Dive (follow them on twitter) for pointing out that Health Canada wasn’t hoarding the inventory data for the corporate media, as we had alleged, they just changed the way they tracked it and the place they kept it without telling anyone (probably because they’re inept, inefficient and wasteful (shout-out Brett Wilson)). 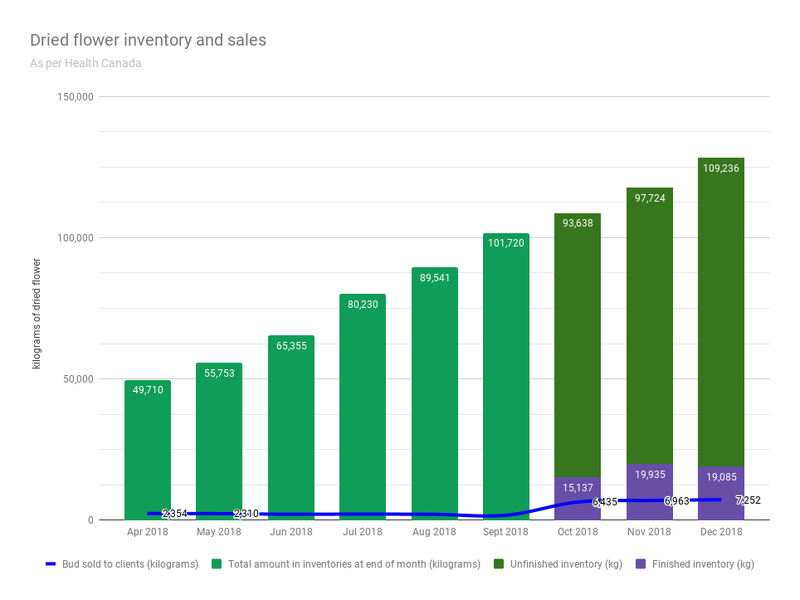 There is nuance to inventory, and Health Canada started to get more granular with the way they counted in October, distinguishing between finished and un-finished inventory. The difference in proportion between the finished and unfinished in the oil and bud categories jumps right out, as does that TOWER of unfinished dried product. These LPs all have slightly different ways of accounting for their inventories and that makes comparing them with each other hard to do, but not impossible. At the moment, we’re just looking for patterns. WEED sets a fine example by also publishing inventory data in weight, but they don’t break down the inventory weight in the same kind of clean stage-of-production breaks that they do with the inventory value. More to the point, WEED stopped breaking the extract grade cannabis out of their published dried weight in April of 2018. The extract/dried split was pretty constant before they quit tracking it. 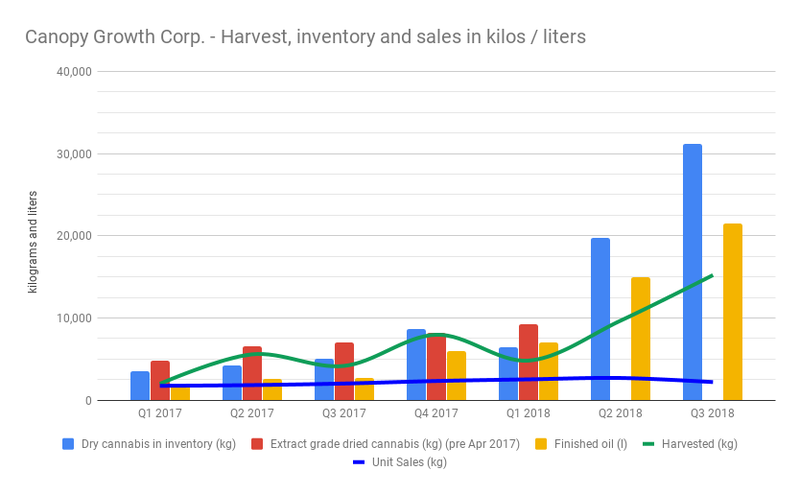 It’s certainly possible that most of the extract grade flower was processed, becoming the spike in oil that Canopy shows in Q2 and Q3, but that isn’t a very good reason to stop publishing the grade split. Extract grade cannabis being considerably less valuable than consumer grade dried flower, one can imagine the change in reporting being either an attempt to get around a grading problem, or to cover an extract/flower split that was widening in the wrong direction. The latter would be consistent with the Health Canada finished/unfinished split being a lot more even for oil than it is for dried flower. 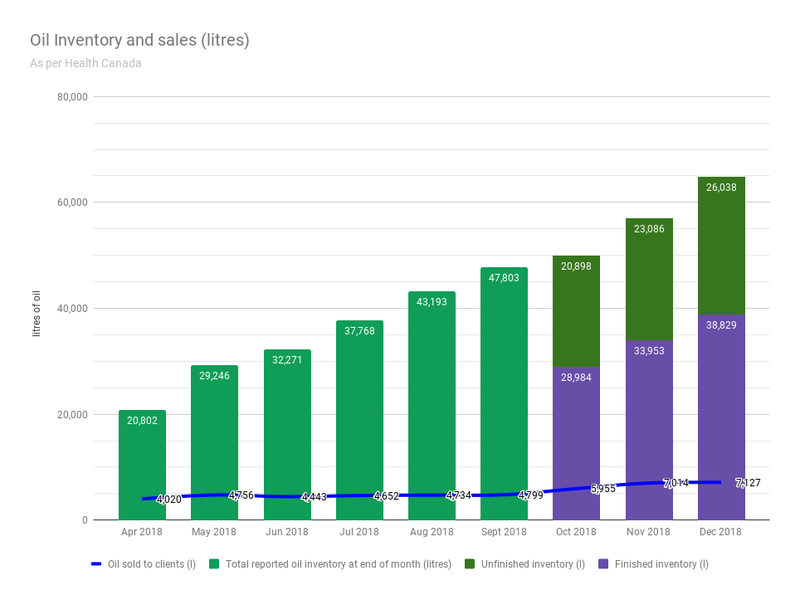 Canopy landed just short of Aphria in our War for retail shelf space series’ product count of provincial dispensaries (data scraped January 2nd). They were stocking 33% of their listed SKUs in our sample dispensaries at the time. The last time the Fundamental Hype catalog spiders crawled Canopy’s Tokyo Smoke online store (January 28th) 86/113 listed cannabis SKUs were out of stock, putting their in-stock product rate just under 24%. Provincial supply contracts being something that have to be lived up to by companies who don’t want to lose them, it stands to reason that the provinces would be ahead of the company store in the line for the re-up. 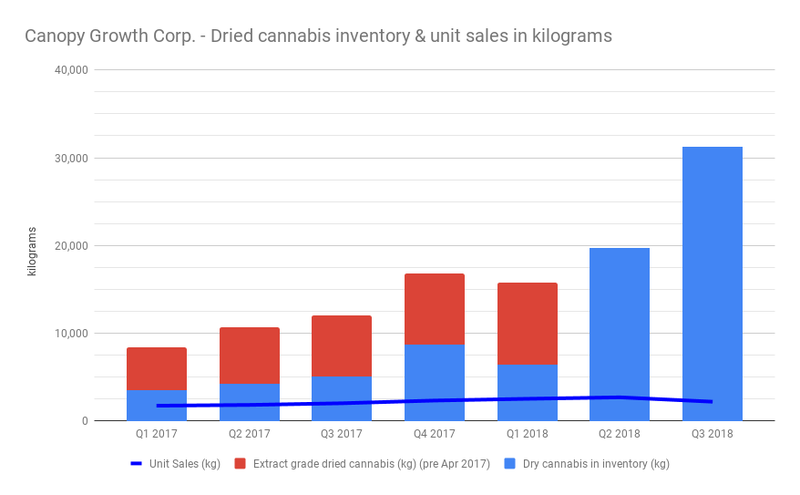 Canopy reports their Q4 earnings on February 14th, and the market is going to be looking for them to put all of that inventory from Q3 into some unit sales. We saw 517% and 91% growth in unit sales from Organigram (TSX.V:OGI) and Aphria Inc. (TSX:APHA)(NYSE:APHA) respectively in their first quarters of the rec era. There are high expectations on the industry bellwether. Fundamental Hype has no position in Canopy, but considers them a test case in whether or not mega-grows are scalable. But the numbers-fiend deep in our soul is pulling for them, because at least they’re publishing weight. Next in our inventory series is Aurora Cannabis (TSX:ACB)(NYSE:ACB), who reports earnings on Monday, does not publish inventory weights and has us wondering if they even know what they have.